RoomSketcher is a free floor plan software app that's hosted in the fluffy white cloud. There's nothing to download onto your pc. You can use a laptop or pc to create your floor plans and they can be viewed on the iphone, ipad and android apps. So far, so good, but it isn't long before you discover that RoomSketcher isn't really free. Sure you can use it for free, but pretty quickly you're coming across upgrade buttons all over the place to be able to use 'premium' features such as 3D which comes standard as free in most other free floor plan software applications. There's 'free', 'VIP' and 'Pro' versions. 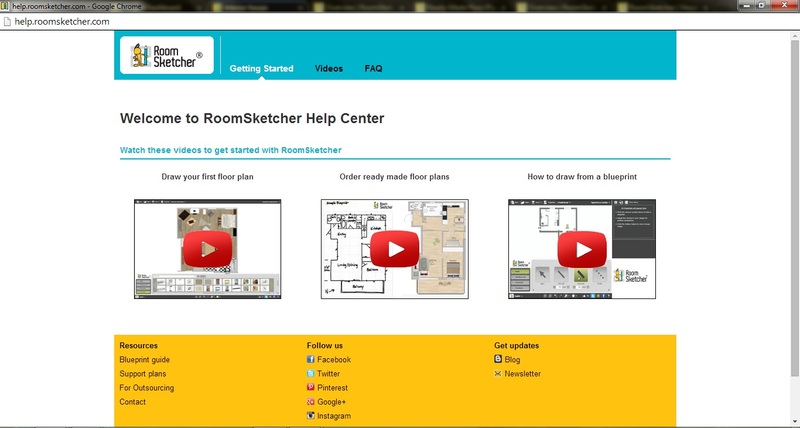 This Roomsketcher review is part of the Free Floor Plan Software series. To use this online application you need sign up first which can be done quickly through Facebook if you prefer. You can get started by drawing your own floor plan, or you can send in your floor plan and have someone at RoomSketcher do the drawing for you (at a price of course). Once you've launched a project RoomSketcher opens a new window that we'll call 'design view' where all the floor plan drawing is done. When you want to change settings, think about printing or change projects you won't get anywhere in the design view. Look for the window you left behind we'll call that the 'dashboard view' (see screen shot below). Drawing your floor plan is free and pretty easy and I like the way it shows you what angle your walls are at. It makes it easier to get things like bay windows symmetrical. The dimensions are shown as you're drawing the walls in but I couldn't find any way of entering dimensions manually. There are two options available for making walls. You have an option to make thick walls, thin walls or a divider. The thicknesses of the walls are adjustable. You can work in inches or centimeters. It's at this point that I noticed the little pictures in the bottom right hand corner of the screen. I'm not sure what the deal is with these. I expect they'll turn into ads at some point. When you click on them you just get brought back to the home page. Anyway - back to drawing the floor plan. Once you create a room or a zone, you can double click and check the option to “show zone size". That will show the area of that specific zone. A bit of a tip - if you want to use more of the screen to see your drawing, you can click on the small arrow on the left of the panel that displays the walls, doors or furniture and it collapses to the right. There's no curved wall option but you can clone your ground floor to the first floor by selecting that outline when you start another level. I also noticed that you can't select multiple elements at the same time. This is a bit annoying if you want to delete a few items at once or change the properties of a set of elements all at once. There's a variety of windows, stairs and doors to choose from. It's very easy to drag and drop the doors and windows. Changing the direction of the doors is also very simple. To change the dimensions of the door you need to double click, and enter the width, length and height. There's lots of furniture to choose from and other stuff such as plants. This is the biggest let down. No 3D for free. So no pics of it I'm afraid. Saving the project is pretty simple. You just need to click save and your projects are saved in the ‘project folder’. In the design view there's buttons to share on Facebook or Twitter or email a friend. To import floor plans you need to pay. Really? There's an option to take a snapshot of your 2d floor plan though. The snapshot wasn't visibile using Internet Explorer. I couldn't work out what format it was saving in. Not great here. I couldn't see any printing option in the free version... until I looked a bit harder at the snapshot option and there's an option to print once you've taken a snapshot. No printing to scale with the free version it seems. Help is available in the form of videos. You can learn how to use this software through these videos and avoid encountering any problems. There's also an option to contact support directly. Let's refresh our memory of RoomSketcher. The free features are limited and don't really compete with what else is available for free out there. There are ipad, iphone and android apps for viewing your designs. The features you can use for free are easy to use. If this is possible, I couldn't find it. Well, the feature exists but you have to pay and this is all about free software. Part of their business model is charging to draw a picture of your floor plan into RoomSketcher. Videos and can ask questions. What do you think of RoomSketcher? I'd love to hear about your experiences using this software.